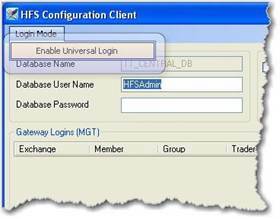 The HFS Configuration Client window, in conjunction with the MGT Information window, allows you to edit database settings, designate MGT information used to determine the gateways from which you want to record fills, and configure the client using a universal login Username and password. When you run the HFSDB.bat file to create a database, you have the option of specifying a unique database name, username, and password via the command prompt. Should you make these edits, you will need to point the HFS configuration client to the database using the database user you specify. 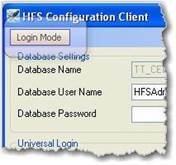 You do this by entering the same database information in the HFS Configuration Client window. On your Desktop, double-click the HFS Configuration Client icon. The HFS Configuration Client window displays. The Database Name field displays the name of the database you selected when creating the DSN connection. To create or configure this connection, refer to Step 14 of the procedure titled, Create and Configure DSN Connections. In the Database User Name field, enter a new username as needed. In the Database Password field, enter a new password as needed. In the HFS Configuration Client window, you add a gateway login for each of the gateways that should have fills recorded. The Member, Group, and Trader IDs (MGT) you enter determine the fills that are sent to the database. Your password serves to authenticate your MGT. All of the exchanges listed in the HFS Configuration Client window are the gateways HFS connects to upon startup. Click the Add MGT button. The MGT Information window displays. In the Gateway Field, enter the name of the gateway that fills should be recorded from. In the Member field, enter the Member ID that should be used to log into the gateway in order to record fills. In the Group field, enter the Group ID that should be used to log into the gateway in order to record fills. 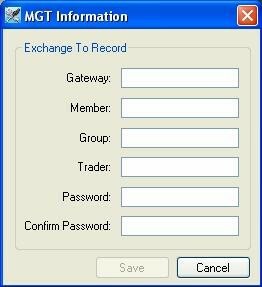 In the Trader field, enter the Trader ID that should be used to log into the gateway in order to record fills. Enter an identical login identifier in the Password and Confirm Password fields. Note: Clicking the Cancel button closes the window without requiring a password. Click Save.Note: Once saved, the data entered in the Historical Fill Server Login Setup window displays in the HFS Configuration Client window, where it can be edited or deleted. On the Success prompt, click the OK button.The HFS Configuration Client window displays the new MGT in the Gateway Loginspane. Note: Repeat this procedure for all gateways from which you want to record fills. Alternatively, rather than entering each gateway login in the HFS Configuration Client window, you have the option of entering the universal login username and password created in TT User Setup. Once set up, the Historical Fill Server will login using that universal login. Since universal logins can be mapped to multiple MGTs, it may be easier for a firm, to configure the HFS using a single username rather than numerous MGTs. Click the Login Mode button. Click to check the Enable Universal Login option. The Gateway Logins section on the HFS Configuration Client window changes the Universal Login section. In the Universal Login section, enter your User Name and User Password as needed. Note: You can ensure your universal login is functional by clicking the Test UL button.